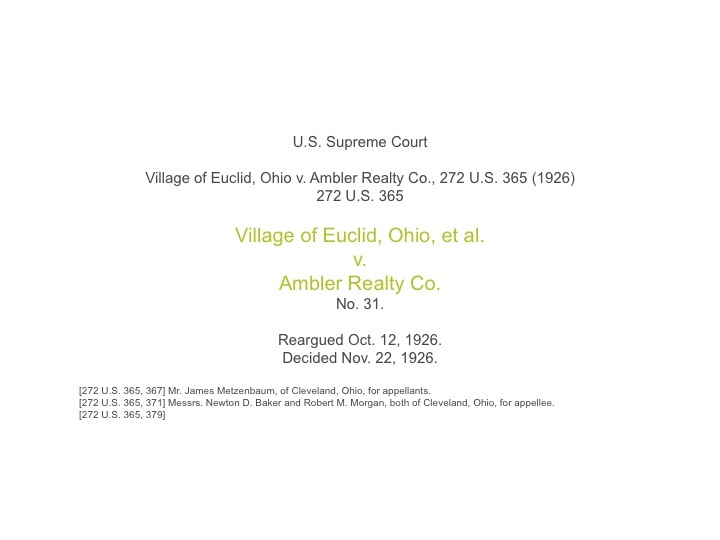 In 1926 the Supreme Court, in a 6 to 3 decision for the defendant, overturned the lower court’s ruling in the Euclid v. Ambler case and made zoning legal, or at least constitutional, throughout the Unites States. This was a watershed moment in the legal foundation for zoning, land-use, and other issues pertaining to development and its regulation. The case itself is fairly straightforward, but there are a number of issues related to this ruling that warrant deeper attention. In order to address all of them in a single post would be cumbersome, and certainly not meet the definition of ‘digestible bits’, so I am going to post a series of shorter discussions about the various issues pertaining to the decision. Hopefully in the end a series of shorter posts will give a good overall explanation of the core issues of the decision. Today’s blog discusses the fundamental element of the Euclid decision. It is the framing of constitutional obligation that provides a platform to rationally address complex planning and development issues. In this case the legal basis for the ruling was that there is a common good that in certain instances supersedes the rights of individuals. Here the common good was broadly described as the health, safety and welfare of the general public against nuisances and other actions that might cause damage to individuals or society in general. So it was found, and has been held subsequently, that the state may take actions, in varying degree, that are seemingly in opposition to the rights of individuals if the appropriate authority deems the action necessary to ensure that future actions, taken by individuals, don’t adversely affect the general public. While the decision clearly provides for the consideration of the collective good, there is also flexibility in this decision that presages many of the challenges we face today. The decision gives us the platform to address healthy environments, sustainability in general and the form of the city. At the time of the ruling the Court rightfully addressed the complexities of land-use in the early 20th century urbanization of the United States. Local officials were concerned that there were significant health and safety issues resulting from inappropriate adjacencies, e.g. the rendering facility next door to the single-family residence. Clearly this was a situation in which a particular use or action by an individual was harmful to another individual. The Euclid case held that this and other issues should be resolved and regulated through the ‘rational investigation by professionals’ to determine the most appropriate method for doing so. The specific method, however, was not the fundamental issue. It was merely a response to a particular circumstance. 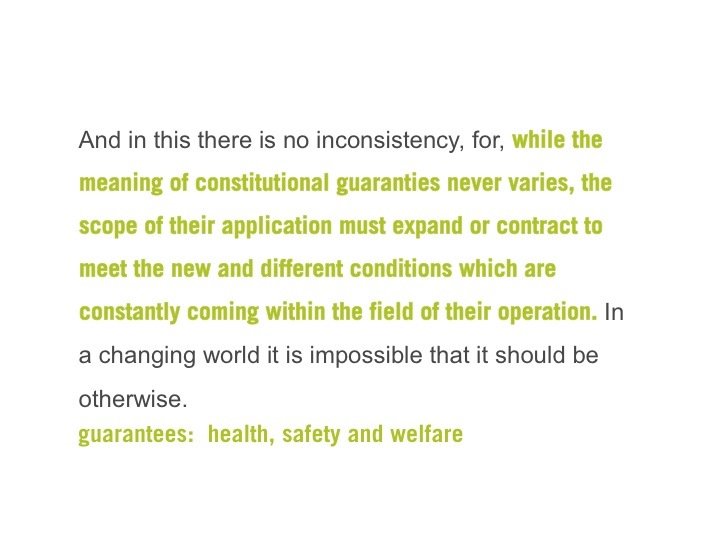 Justice Sutherland explained in the court’s ruling, ‘while the meaning of constitutional guarantees never varies, the scope of their application must expand or contract to meet the new different conditions which are constantly coming within the field of their operation.’ Here Sutherland is simply saying that the meaning should not change through time (the guarantee of health, safety and welfare), but that circumstances, and the application of that meaning relative to circumstances, will change. Even more simply put, he is saying that we should do what is right, based on what we know. We must guarantee health, safety and welfare, whatever form that might take. While escaping from the city in 1926 may have seemed prudent advice for staying healthy, we now believe, almost 100 years later, that this has actually caused us to become less healthy. We still want to be healthy, but new evidence is beginning to tell us that the way to do this has changed. This is the core concept of the case, and the concept that should drive the regulation of development and operation of cities, but it has never surfaced as an important issue in the various legal battles that have followed the Euclid decision. Most of the subsequent arguments have been about very specific (e.g. takings, property rights, etc.) issues. This is an exercise in which the solutions to broad issues are sought through interpretations of specific circumstances. This is neither rational nor effective, which is in direct opposition to Sutherland’s advice. In practice if we were to acknowledge that application of meaning varies by time and place, we would see that the regulations in place in 1926 in Euclid, Ohio, for instance, might not be appropriate for Phoenix, Arizona in 2012. Or, even more importantly, regulations adopted in the 1950’s might not be relevant for cities in the 2010’s. The court clearly understood that the methodology for ensuring the health and safety of the population would have to change and be open to modification. The Euclid decision was never intended to be a broad application of specific zoning criteria, and the justices say as much. Today there are a number of planning strategies that might be put in place for which regulations could be created to more fully address these basic guarantees. Scientists and planners alike accept many of these strategies, but there is a disturbing lack of data to support most of these ideas. If planners are to follow Justice Sutherland’s charge, the profession is obligated to make rational decisions regarding the creation of a regulatory framework that can successfully address these issues. This effort requires a greater level of rational, scientific research in order to ensure that we make the right decisions. This excerpt offers clear advice on strategies to frame planning processes moving forward, basing decisions on logical, tested results; resolving the larger issues first and then working towards solutions to more specific details. In the absence of this, the result will be the continued making of bad decisions (and there are a lot of very bad decisions in the regulatory process). give a quick shout out and saay I really enjoy reding through your blog posts. Can you recommend any other blogs/websites/forums that cover the sae subjects?